Lavawheel Volcano is the eighth level of the secret Cloud world from Donkey Kong Country Returns 3D. It represents the eighth world of the game, the Volcano. The main mechanics of the level are the large gear-like stone wheels that rotate clockwise towards the camera, the cogs of which can be used as platforms. Heading right, Donkey Kong and Diddy Kong will find a stationary stone wheel. When jumped on, however, it will start to move. After jumping past the first one, the Kongs will find three already moving stone wheels, which they must jump along to reach the other side before the cogs sink into the lava. The Kongs must then avoid three Ultra Char-Chars and will eventually come across more wheels, except the cogs on these ones are flat and can be jumped through. The other side of the wheels leads to some Tiki Goon enemies and eventually a big yellow button. Once pressed three times, two wheels in front of the Kongs will rotate in place to form platforms, while a third one will roll away, revealing a gap. After pressing the button and reaching the first checkpoint, the Kongs must launch themselves from a Barrel Cannon to the platform of the third wheel that rolled away earlier (now connected to an even wider wheel). As soon as the Kongs land, the wheel will start to rotate slowly, in which case they must quickly head right while avoiding Ultra Char-Chars. At the end, the Kongs will end up on another wheel with more Ultra Char-Chars, except they must jump up to higher platforms as the wheel rotates into the lava. They should then head right and jump along smaller wheels to reach the next checkpoint. 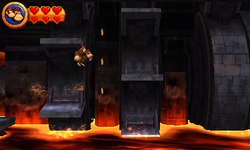 Past the second checkpoint is another wide slow-moving stone wheel which the Kongs must quickly run through while avoiding Char-Chars and falling into the lava. At the end is another wheel where the Kongs must climb higher up as the platforms sink into the lava to reach the Slot Machine Barrel. At the beginning of the level, the Kongs should go left to find a windmill hidden from view by the stone wall. When blown onto, multiple Bananas and the Puzzle Piece will fly out to the right. The pot past the first stone wheel contains a Puzzle Piece. When on the wheels with the flat platforms, the Kongs should use the last two platforms when they are around their highest point to reach the Puzzle Piece. The Kongs should pound the platform to the right of the first Tiki Doom to reveal a Barrel Cannon leading to a Bonus Area. Here, the Kongs must use the moving Barrel Cannon to collect every item to reveal the Puzzle Piece. On the wheel where the Kongs must jump higher up to avoid the lava, they should collect every Banana there to make the Puzzle Piece appear on the right. On the wide platform after the second checkpoint, the Kongs should find a pot halfway through (before it sinks into the lava) containing a Puzzle Piece. On the final stone wheel, the Kongs should wait until just before the wheel is fully rotated to find the Puzzle Piece on the far right. Guruguru Borukēno Rotating Volcano, 「ぐるぐる」 guruguru being onomatopoeic for rolling/spinning/turning/winding/etc. This page was last edited on April 13, 2019, at 01:01.